We are back from Tucson now and my computer is fixed. On my last day there my computer hard drive failed completely. I took it to the genius bar at La Encantada Mall but they would have had to keep it for a few days and I was leaving the very next day, so I brought it home dead and took it to the Apple store here in Boston. Luckily I had backed it up just a few days before I left for Arizona so no data was lost and my photos were all backed up on the cloud so I didn't lose anything. I did do some drawing while I was out there. 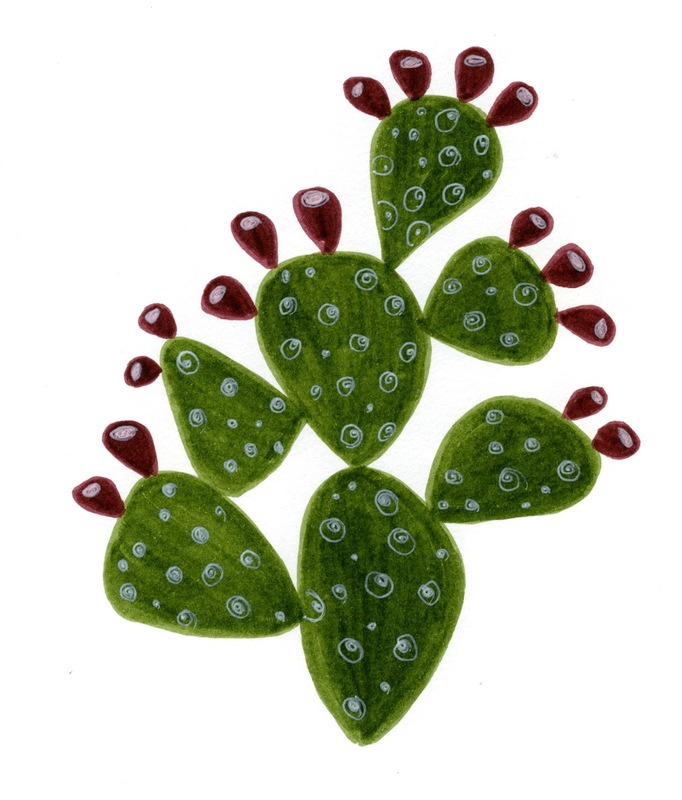 I was mesmerized by the deep maroon colors of the prickly pear fruit. In Florida the fruit was a lightish pink, so quite different. I couldn't sit out on the porch to draw though as I usually do since it was much too hot out there. Even with both ceiling fans going at full speed! It was like sitting in a convection oven! All the cacti are so plump when it rains out there though. They all look quite happy. There is still a lot of stress in my life right now which I can't/don't want to speak about. Suffice it to say that we are all under extreme duress and my artwork has really taken a back seat. Hopefully it will come back at some point and I will be able to concentrate on my work again. But not right now. Glad you are back....try Mediation...honestly...it works...sure hope all get sorted out so you can get back to your wonderful art!!! Again, mediation!!! Hi Roberta. I hate to hear that your life is in turmoil. I hope the situation passes quickly. In the meantime, best wishes and hopes that life will right itself quickly. I'm so very sorry to hear that you're going through such a difficult time, Rebecca. I've always thought of you as one of the nicest people I've ever had the pleasure of meeting - you truly are a good person, a role model, and a source of inspiration. I think of you so often, and I hope things get better for you soon. If there's ever anything I can do for you, please don't hesitate to get in touch. I know from personal experience how important it is to have a support network during difficult times, but how hard it is to ask for help. I have also learned that good friends who offer you help really mean it, and they would be truly happy to make things better for you in any way. I hope you will count me in the group of people you feel comfortable to ask for any help I might be able to give you. If you need someone to simply listen to you talk about anything without any agenda, expectations, or judgment, or just be there on the other end of the line when even talking is too much...please know I mean it sincerely when I say you can call on me ANY time, without guilt or any sense of obligation. As hard as the big things are to deal with, often it's the mountain of little tasks that make life so much harder and drain all the energy you need for more important things. Let me know if I can make phone calls for you to track something down or follow up on something; run an errand for you here in Boston; go online to reasearch something or order something you need...anything at all that needs to be done, but can be done remotely and doesn't need to be done by you personally. Just ask. Hugs, my dear, and best wishes for good things! xxoo - L.